Description: Difficult and extremely challenging, even for the finest, low-handicap players, the Black is noted for its elevated tees, hilly and rolling fairways, dense rough, and tremendous fairway bunkers. 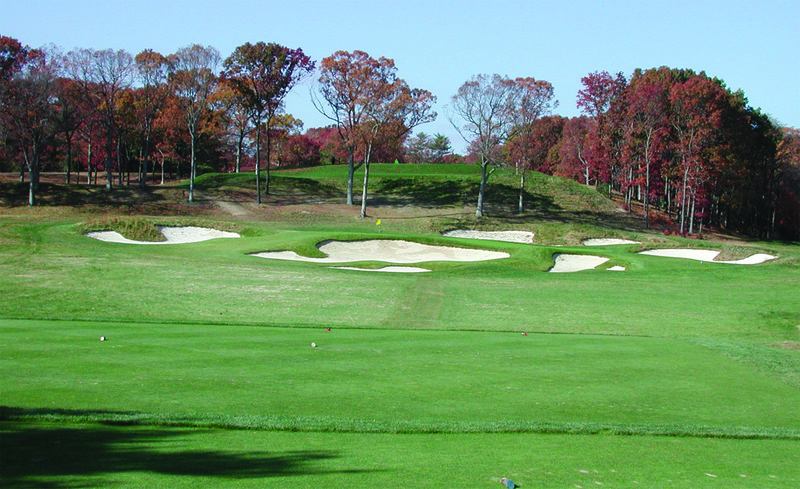 The small greens are also surrounded by huge, deep bunkers, and Tillinghast’s inventive use of depth perception makes any shot to the green challenging. 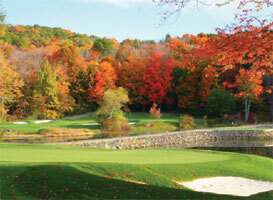 The course has always been revered by the local golfing public, and often thought of as a little too tough. The length, even from the middle tees, is Herculean, and the classic sight lines and necessary course management are Tillinghast trademarks. The incredible bunkering around par-3, 17th green. The fairway bunkers are as dramatic as anywhere in the U.S. (maybe with Pine Valley the exception), and many of the small greens are surrounded by deep, fear-inducing sandtraps. It is a true test of golf, along with one’s mental capacity for pain. If you’re a high-handicapper, you might be better served keeping your clubs in the trunk and just reveling in the place where Tiger Woods won his eighth major and Lucas Glover won his first. Description: One of the area’s best maintained facilities, the greens and fairways here are kept like any quality private course. The front nine is built around the reservoir with many of the holes playing alongside it and some playing over it. The back nine offers numerous ponds and streams - and even quicksand on the 15th and 16th holes. The layout offers numerous doglegs, blind shots, and some very hilly holes with sloping fairways, making it tough to find a flat lie. The beautiful, serene setting at Richter Park. Water comes into play on 14 holes. The greens are mostly large and multi-tiered, normally aptly bunkered and not easy to approach. Club selection off the tee is always a vital decision. It’s a tough, but fair test for even the low-handicapper. Reader Comments: Beautiful, scenic, park-like setting with all the water makes it one of the prettiest courses around ... Challenging and difficult but fair and immensely enjoyable ... Fabulous design, very well kept ... Great mix of holes ... A must play for every serious golfer ... A very special place! We’re lucky to have it in our area.